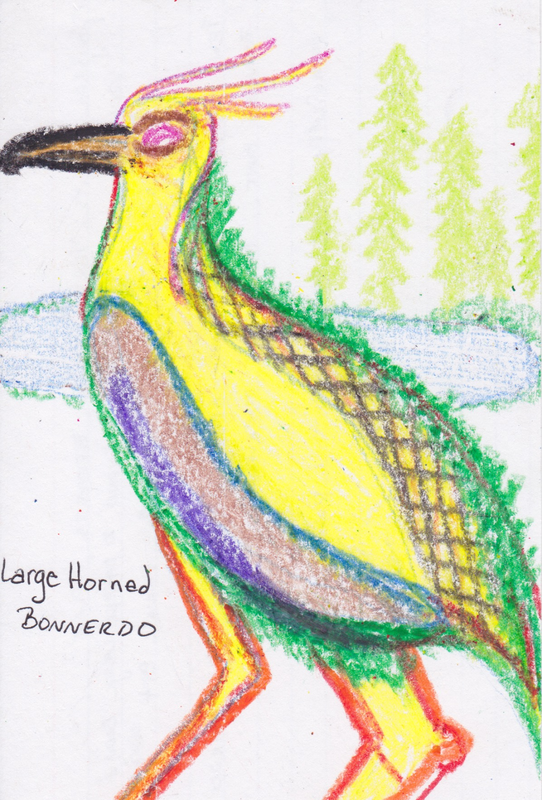 This is the Large Horned Bonnerdo. This exquisite specimen is among one of the largest and most prolific breeders we've ever encountered. We've noticed that they are incredibly territorial and typically nest near secluded bodies of water. Size: Similar in size to a NBA player (avg. 6' - 8' tall). Females are typically larger and more territorial. Coloration: Born with unique purple chest surrounded by a deep brown and yellow body with a crosshatching pattern on its back. Flight Pattern: Does not migrate; patrols body of water. Unfortunately, we've not been able to collect remains of the Large Horned Bonnerdo, it is theorized that they could bury their dead. However, it's more likely that they consume their dead whole.